It's Cyber Monday, which means that deals can be found all over the web for people more interested in shopping at their desk than doing work. 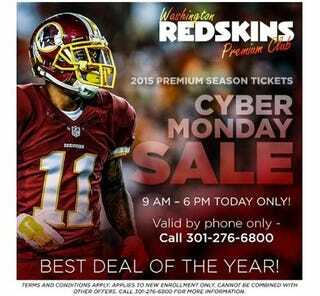 The Redskins have a Cyber Monday deal today, too, but they don't quite understand how the "cyber" part is supposed to work. It's not "Telephone Monday," Dan Snyder.